Known as a text of liberation and enlightenment and praised not only by Indians but also by prominent modern thinkers such as Aldous Huxley and Albert Einstein, the Bhagavad Gita is one of the most commented-upon books of all time, yet one aspect has never before been examined: Arjuna's psychedelic soma experience with his guru Krishna. Drawing upon his many years as a student of Nitya Chaitanya Yati, whose teacher was Gita scholar Nataraja Guru, preeminent disciple of Narayana Guru, Scott Teitsworth explains how the Bhagavad Gita, through the story of the hero Arjuna and his guru Krishna, provides complete guidelines for the spiritual use of entheogens--from prior mental preparations to the integration of profound visionary insights into everyday consciousness. 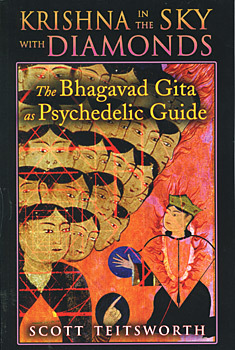 Examining Chapter XI of the Bhagavad Gita verse by verse, he illuminates Arjuna's complex revelatory experience and exposes Krishna's role as the ultimate spiritual guide--facets of the Gita evident to anyone with psychedelic experience yet long suppressed in favor of paths to enlightenment through service or meditation. He shows that psychedelics are indeed "gateway drugs" in that they stimulate open exploration of the mind and the meaning of life. Uncovering new depths to this revered manual of spiritual instruction, Teitsworth reveals psychedelic experience to be an essential and ancient path to ignite realization in the prepared student, turn theory into direct experience, and bring the written teachings to life. "The Bhagavad Gita is a classical spiritual text, but whoever would have imagined that it could serve as a guide to psychedelic experience? Krishna in the Sky with Diamonds is a tribute to the insight and creativity of its author, Scott Teitsworth, a longtime scholar of Indian philosophy. Teitsworth takes his readers on a tour of Vedic teachings, one that avoids simplification. But the challenge is worth it; with or without the use of mind-altering substances, an immersion in this work cannot help but open the door to that intangible goal known as enlightenment." Scott Teitsworth is a lifelong student of Indian philosophy and modern science under the tutelage of Nitya Chaitanya Yati, himself a disciple of Nataraja Guru. An editor of books written by these gurus, he hosts the Portland branch of the Narayana Gurukula along with his wife, where they have taught classes on the Bhagavad Gita and Indian philosophy since the 1970s. He lives in Portland, Oregon.